High performance durable inherent FR garments, meet the ROOTS Kermel range. Inherent FR, done the ROOTS way. At ROOTS we pride ourselves with the levels of safety we can achieve with our multitude of ranges made up from a multitude of our own treated fabrics. One thing, however, has been a challenge for us since the beginning, achieving comparable levels of safety with an inherent FR fabric. This is much easier said than done and although we had some decent results with some fabrics we never felt that they were of the ROOTS quality that we strive for. That was until we got in touch with Kermel®. Kermel® is the leader in the production of aramid fibres for apparel that protects against heat, flame and electric arc. Having a history with making suits that have long been worn and trusted by firefighters, law enforcement and members of the armed forces has given Kermel® the extra experience and know how to create exactly what we were looking for: the best inherent FR fabric available. Kermel® fabrics boast some of the best protection levels available on any inherent FR garment on the market, the protection is so good that it can in fact rival even the best treated FR fabrics out there. To make sure our ROOTS Kermel® performs to the high standards we set for our garments they are tested for 100 washing cycles according to the EN ISO 11611, 11612 and EN ISO 20471:2013 + RIS-3279-TOM, keep in mind that the requirement for these tests is no more than 5 washing cycles. The fabrics have also been tested for both industrial and domestic laundry according to the ISO 6330:2012 and ISO 15797:2002. All this testing leads to our ROOTS Kermel® garments being a durable powerhouse when it comes to long-lasting protection that one can rely on. On top of the many safety standards, Kermel® has also earned the OEKOTEX standard 100 label. The OEKOTEX 100 label is a certificate for a high standard of human-ecological requirements given out by OEKOTEX as an independent party. Britain’s railway system is one of the safest and most intensively used rail networks in the world. This good safety performance is achieved by the high industry standards that the British railway has set in place, this high bar for safety also applies to the standards required for the workwear used on the railside. We meet these high industry standards with our ROOTS Kermel® inherent FR offering which is rated for railway work in accordance to the UK Rail Industry Standard RIS-3279-TOM / GORT 3279. This standard is based on the EN 20471:2013 of which garments have to comply to at least class 2. The aim of this is to ensure that workers both on and near the tracks are highly visible and easy to spot for not only trains but any other traffic as well. With ROOTS Kermel® not only having an incredibly impressive performance against ARC and heat but also a very good colour fastness even after 100 washes, Kermel® has proven itself to be a perfect marriage for any railside work. At ROOTS a commonly used phrase is “the proof is in the pudding” when talking about how an FR garment performs, with Kermel® this is no different. Just like our Stormbuster, Flamebuster, Multi-Protector and all the other ranges we subject the ROOTS Kermel® fabrics to the intensity of the manikin-test. A manikin test is a test where a garment gets placed onto a high-tech manikin which has sensors that accurately measure the percentage of first, second and third degree burns. This manikin then gets subjected to a simulated flash fire which is done by shooting the manikin with flames from multiple directions for a total time of 4 seconds. After this, we receive an infographic showing us the places of the burns are and how severe they are. The lower the combined percentage of 2nd and 3rd-degree burns are the better protects in a real-life hazardous situation. It is for this reason that we do these tests on top of the mandatory EN ISO 11612 A1 A2 tests, we truly get to know what are garments are capable of in a real-life situation. Below is a video of one of these manikin tests in action on our ROOTS Kermel® Textreme coverall. This particular test resulted in a total body burn prediction of 13.7% which consisted of 10.3% 2nd degree and 3.4% 3rd-degree burns. This is a hugely impressive result for an inherent FR fabric made up from a blend of PES, modacrylic, aramid, and CV FR. Would there ever be the disastrous day where everything goes wrong and our this is the last line of defence against the fury of the flames then we can be certain that it will offer the best possible protection available. 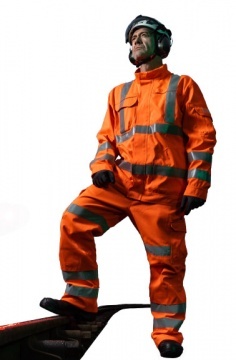 Providing protection is important for any piece of workwear but having a good fitting protective clothing is just as important. A bad fit can lead to a poor range of motion, discomfort, increased chance of injury and an actual decrease in the protection offered on some garments. For men’s workwear, this has become somewhat of a non-issue as most manufacturers offer a variety of sizes and lengths to be able to offer the correct fit to any man. But what about the women? 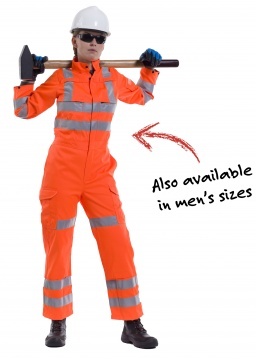 Because of the severe lack of fitting women’s garments in the industry we noticed that most of the time women would have to settle for a smaller sized piece of men’s workwear which results in a poor fit and increased hazardous risk in a working environment. It is for this reason that we have designed a new ladies fit range for our ROOTS Kermel® inherent FR offering that provides the perfect fit ensuring comfort, reliability and practicality all in one package. Sustainable workwear is something we are striving to achieve for many years now and it was of high importance that our inherent FR offering would be environmentally responsible as well. Because let’s not forgot that the world’s second most harmful industry to the environment is the textile industry, the first most harmful being the oil industry. This dubious honour is thanks to the vast amounts of water pollution, CO2 and other waste that is the result of the process of creating a piece of clothing. Change is necessary and Kermel® is the partner helping us make that change. Steps that Kermel® has taken that help bring down the waste are using less packaging at the source and sorting the waste to easily recycle it afterwards. Kermel is also actively involved in clean technologies programs that are used to preserve air quality during the fibre drawing process. Water quality is preserved by recycling wastewater from the fibre drawing process and implementing new cleaning processes, this leads to less total water having to be used and more of it being reused. All these steps have now led to a reduction and in some cases, even an end to specific compound releases at the treatment plant. Those are the steps during the process but what happens to the clothing once it’s been used? New products using recycled Kermel® fibres are now under development for a range of applications like transport and construction. Woven fabrics for fire-fighters and nonwovens for electric arc protection. In the future, about 35 to 40% of these Kermel® fibres are to be recycled into new garments.